Target Black Friday Deals for 2018! Black Friday Deals LIVE Now for Red Card Holders! *Target is now LIVE for Black Friday sales for Red Card holders – the discount will not show for you until you enter your Red Card number at checkout, so don’t worry! Just make sure after you enter your Red card info at the payment info, that the prices adjust before you checkout. 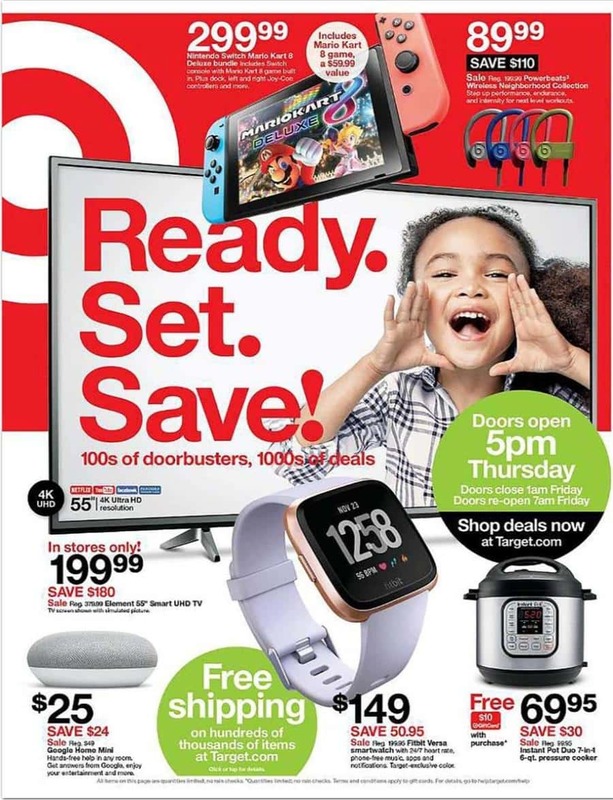 Target has released their Black Friday ad scan! Target’s doors open at 5 pm on Thursday November 22, 2018 (Thanksgiving evening) and close at 1am on Fri 11/23. They will re-open 7 am 11/23 and the deals will be good through Saturday November 24, 2016. All items are while supplies last. Most deals have limited quantities of each item. No rain checks available. A great way to save a little more at Target is to sign up online for the Target Red Card, where you can get 5% off your total purchase on every purchase, free shipping at Target.com. Make sure to check out Target.com on Wednesday evening to see if any of your favorite Black Friday deals are online as this is often the case the last few years! Plus they are offering free shipping on all orders right now. Browse the full Target Black Friday Ad here! We have a special feature for some of the most popular stores featuring both the full ad scans, as well as a searchable list of all the deals you will find at Black Friday at Target. You can see the full list of deals or you can search in the search bar to find what you are looking for specifically or narrow it down to see all items in certain categories. This will make it very helpful if you are looking for a particular product or if you want to compare prices on items, such as looking at the prices on electronics, kitchen appliances, etc. I couldn’t find this pricing. Is this an error or is there a coupon/code?